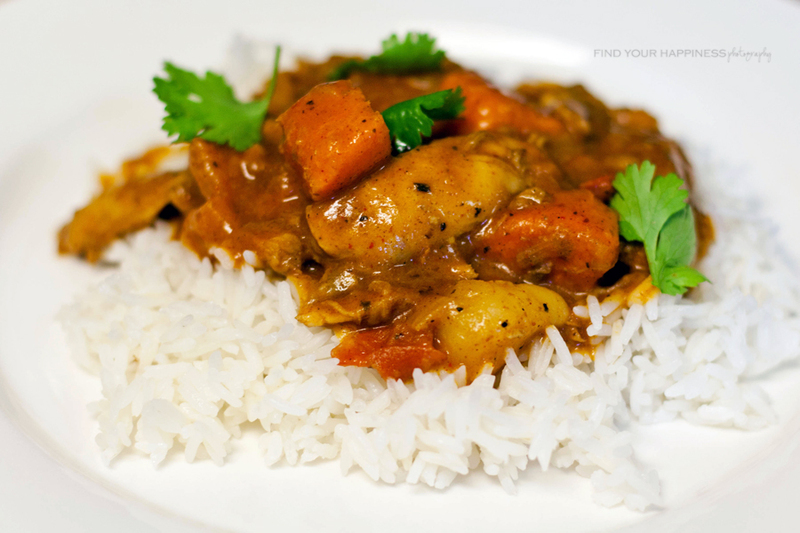 I made Coconut Chicken Curry last week and my husband has been (literally!) bragging about it to everyone. It really was delicious and taste even better as leftovers because the flavors had more time to marry together. Even our sixteen months old son eats this like a pro whereas I have to take breaks and sips of water every few bites because it's spicy. We also had leftover Lemony Lentil soup with mini-sausage meatballs and greens from the previous day and when we ate both leftovers together, my husband said he felt like he was eating in a local cafe in the middle of downtown Beirut, Lebanon. You can serve this with bread but best over a bowl of hot rice. Place potatoes in hot boiling water and cook for 10 minutes (still a little raw). Remove from heat, drain and set aside. In a large sauce pan, heat oil on medium-high heat and saute onion and garlic until onion is translucent. Add chicken and continue cooking until the chicken has lost its pink colors. Add all the spices and potatoes and stir well. Continue to cook until chicken and potatoes are tender. Add tomatoes and coconut milk and heat until sauce is thickened and bubbly. Serve over hot rice and garnish with (lots!) cilantro. Oh yeah, going to try this real soon! Sounds delicious! this looks mouth watering delicious!!! I think I must try this very soon! Thanks for sharing! That looks really good! First tried curry when I went to Japan and fell in love with it. New follower from the blog hop. That looks like one yummy curry! I might just have to try it out! Thanks for sharing the recipe. Just stopped by from the Friday blog hop. I’m following you now and hope you’ll stop by my blog sometime too! Have a lovely weekend. YUM! I think we will be eating this for dinner TONIGHT! What a great idea to put potatoes in it. Sounds really tasty! And I love the herbs you have on top, they always make a meal more fresh I think. Nice job! P.S. Looking forward to trying this recipe! I'm always looking for new things to make!